So, I did it. I sucked it up and went blueberry picking with my toddler. Torn about taking G blueberry picking tomorrow. It would be easier w/o him, and I wouldn’t have to worry about nap timing if I leave him behind. Someone tell me it will be okay if I take him? I was really on the fence. I liked the idea of sharing the experience with him, but I was fairly sure I would accomplish more without him, and I really don’t like messing with nap time. Some things are sacrosanct, and nap and bed times fall into that category around here! And I could always take him next summer, right? But I was going to have my MIL along to help, so I went for it. Unfortunately, I didn’t plan well, so Tuesday morning found me madly running around the house, trying to get our lunch packed, self dressed, potty and some toys packed . . . . I really almost called the whole thing off then and there, and the first five minutes in the car, on the way to meet my MIL were no better. Whiny toddler, still-stressed and frazzled mama — not a pretty picture. I forced myself to take a few deep breaths and just drive. Anyway, my game plan was to start early and tire the little Pookle out enough during the morning that he would nap in the car on the way back (car napping = often not his strong suit). The blueberry patch was already hopping by the time we arrived (and unfortunately, already fairly picked over — there were, technically, plenty of blueberries out there, but at this stage, it took longer to pick a given amount). 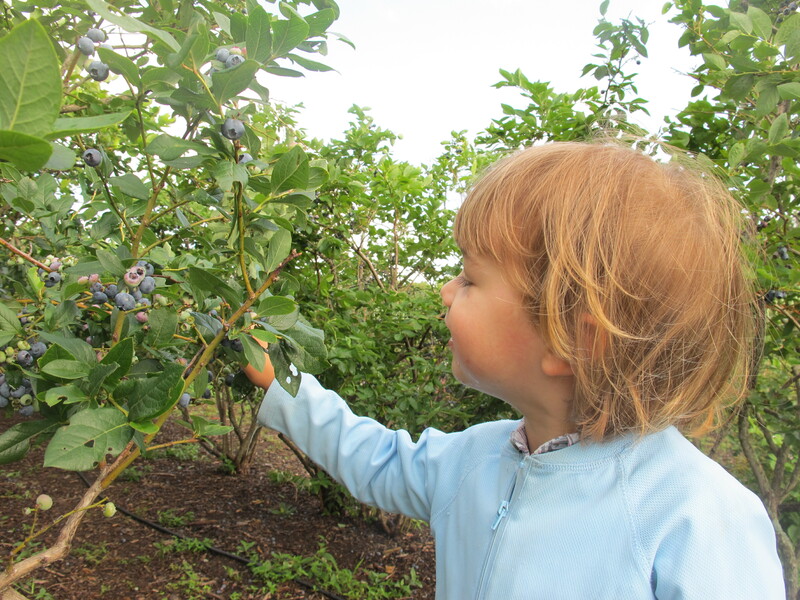 As expected, Gabriel went right to work, picking and eating blueberries. I love that my not-quite 3-year-old totally knows how to identify ripe berries. My goals for the morning were to pick 5-6 gallons of blueberries and keep G from turning into a blueberry, a la Violet Beauregard in Willy Wonka. My big bucket was the dump truck, and Sir’s little bucket was the backhoe scoop. His mission was to fill the backhoe scoop with berries, and dump them into the dump truck. This game yielded almost an hour of picking and [mostly] not eating! In the end, given the not-so-great picking conditions, my MIL and I, combined, only picked about 4.5 gallons of berries. She’s planning a trip to Wisconsin and hopes to find more berries there, so she very generously gave all her pickings to us. Still short of my goal, but not bad! My nap plan sort-of worked: within 5 minutes of leaving the blueberry farm, G was snoring in the backseat. However, I made my plan thinking that the farm was about 90 minutes from home, instead of the 50 minutes it actually is (I was aware of the corrected driving time, and thus reduced nap time, going into it). I knew he would almost certainly wake up when we exited the interstate, but I wasn’t willing to drive extra just to extend the nap. A 35-minute nap is NOT ideal, but better than nothing! This entry was posted in Cuteness, Food and tagged eat local. Bookmark the permalink. Cute video! Happy boy. Glad it worked!